The holidays are fast approaching; are you ready to for your business to be filled with moms, dads, friends, and little kids begging their parents for a present? While the holidays can be a great time to get together with family and friends, it can also be a little hectic. If you own a business, then you can get the short end of the stick when it comes to the holidays. Long hours can be difficult as well as trying to get rid of all of the merchandise that you may have purchased since the holidays are right around the corner. As a merchant service business, we strive to offer you with a variety of suggestions to make running your establishment easier. Journey Business Solutions is a small business, which is why we know so much about helping you. In today’s blog, we’re going to help you when it comes to the holidays. 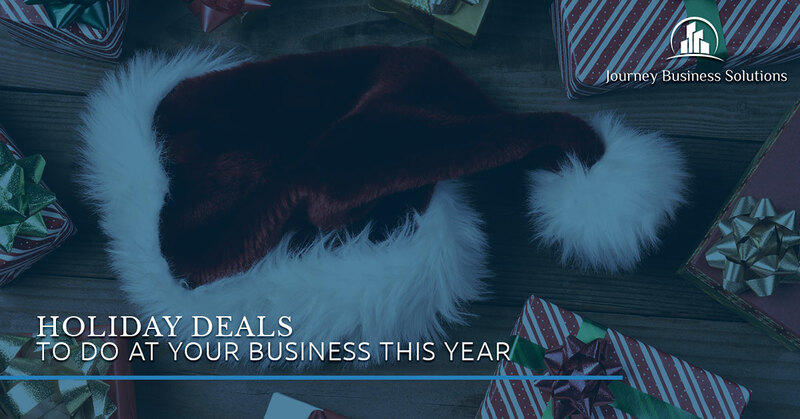 As a business, it’s in your best interest to celebrate the holidays with some great deals. Not only will it help get people in through the door, but it can also increase people’s knowledge about your store, website, or business. What’s neat about the holidays is when someone purchases something from your establishment and the gift-receiver likes it, they’ll know of another store to check out. It’s getting the word out about your small business without you having to do anything, except impress people with your services or products, of course. Since we’re a small business, we strive to be your one-stop-shop when it comes to merchant services, POS systems, and more. At Journey Business Solutions, we serve the Houston, Beaumont, Fort Worth, San Antonio, Rio Grande Valley, and Dallas areas. So what holidays deals should you do at your small business? What works, what doesn’t work, and what should you know to avoid at all costs? Well, as a small business owner, you probably know that it comes down to your business, demographic, locations, and online presence. Every small business is different, so it’s a trial and error process. However, these four holiday deals can be a great option for every small business. Not only will they get people in through the door, but it can also increase your sales, which everyone wants, especially around the holidays. Coupons can be the saving grace of the holidays. You’re spending a lot of money on the holiday season. In fact, an average holiday shopper sill spend almost $950 on food, decor, and gifts. That’s a lot of money! Coupons can be a great way to bring back repeat customers, friends, and family. What’s neat about coupons is that there’s no wrong way to do them. You can offer a coupon with a purchase to bring those repeated customer in. You can opt for a coupon to be sent out via email to bring in customers or you can hand out coupons to new customers. Coupons will get people through the door because everyone likes a special offer. Another fun idea is to make a twist on the 12 Days Of Christmas. Use the 12 Days Of Christmas song as inspiration for giving something fun away to your customers. You can get very creative with it as well, which is always fun, especially around the holidays. Giveaways can bring new customer, keep older ones, and bring in repeat ones. Everyone loves something that’s free, no matter how small or large it may be. During the holidays can be a great time to offer a service for 12 free days or give a prize away. You don’t have to do a lot either, just put your own spin on it. Perhaps have a bowl of customers’ names and you pick one every day for them to win a prize. Maybe as a service you have 12 free days of that service or a discount if you can’t afford something for free. Email campaigns are great any time of the year, but with so much traffic online, it can be even more beneficial during the holidays. Sending out email campaigns can be a great way to get creative with bringing in customers as well. You can do something similar to the ‘12 Days Of Christmas, but with the email campaigns. You can send out an email journey with each day being a different deal or you can just inform people about new products that are in store and would be a great idea to purchase for your loved ones. An email campaign comes in many different forms, but it’ll highlight some benefits to visiting your small business. Lastly, last minute holiday deals! If you’re not much of a planner, then this one can be a great option for you. Not only does it help those shoppers who are a part of those who procrastinate when it comes to buying presents, but it can also offer some great promotional options. By giving your customers an incentive to stop in for holiday needs, you won’t have to worry about having too much for after the holidays. Try a 15 percent storewide deal or a specific deal on a product that you have in store on online. With the holidays upon us, take the opportunity to get those customers in through your small business. For more information on holiday deals, stay tuned.